The upcoming Motorola duo is getting priced around the world, now Brazil has chimed in. 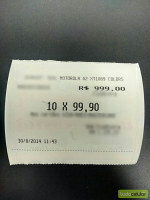 Someone managed to sneak a photo of an inventory system, which puts the Moto G2 at BRL 999 and the Moto X+1 at BRL 1,499. In dollars and euro the Moto G2 price works out to $445/€340. 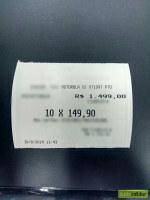 We've heard much lower prices elsewhere - €250 in Europe and as low as INR 13,000 in India (equivalent to €165). Keep in mind that Brazil has some hefty taxes on electronics, especially ones not manufactured locally (Google sold off the Brazilian and Chinese factories back in 2012). An Apple iPad gets as much as 55% markup after taxes. Anyway, the Moto X+1 price is set at $670/€505. The Moto X last year was priced at BRL 1,499 (it has come down since), while the Moto G2 was BRL 650. The Moto X+1 will deliver a hefty spec increase compared to the original Moto X. It will have a 5.2" 1080p screen, Snapdragon 801 chipset and a 13MP camera with 2160p video capture. The Moto G2 will also improve on its predecessor, with a 5" 720p screen and 8MP camera but will keep the Snapdragon 400 chipset. 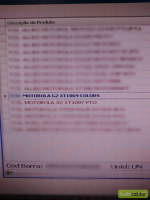 The G2 is listed as "Motorola G2 XT1069 Colors", suggesting there will be multiple color options. Thanks to Lucas for sending this in! Welcome to Brazil, my friend!